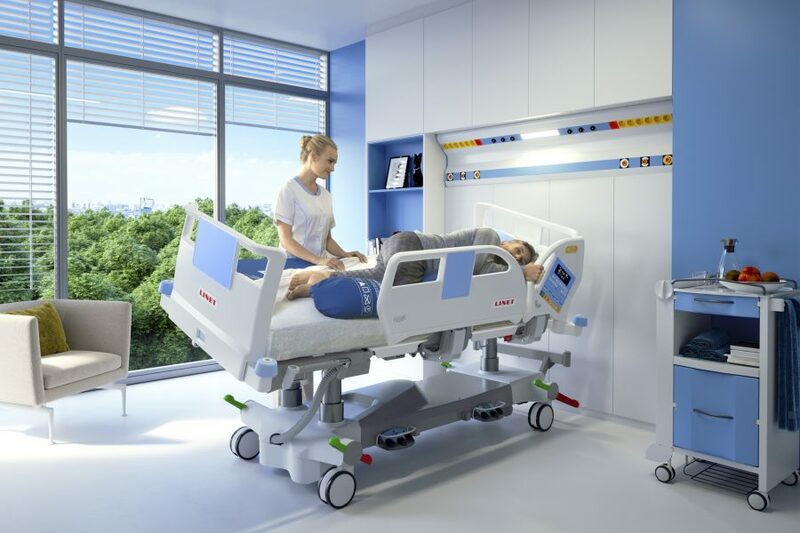 Linet produces hospital beds for the 21st century. 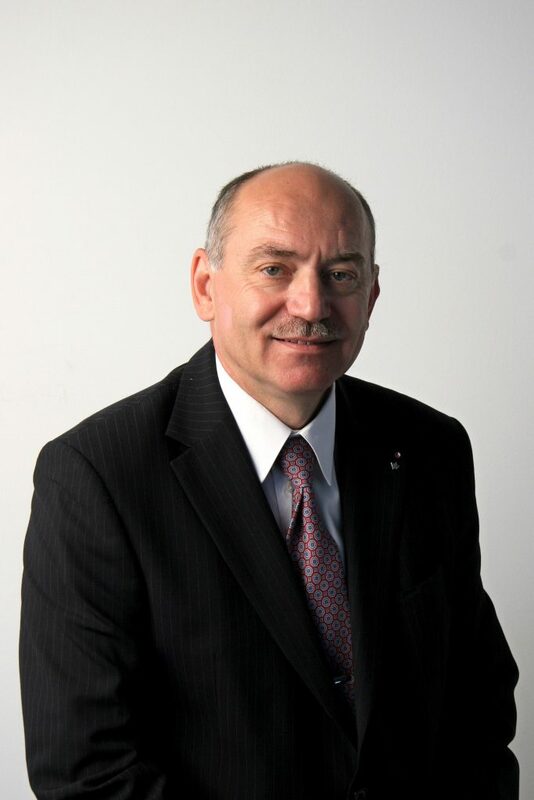 The founder of the company, Zbyněk Frolík, along with a team of technicians equipped a bed model with telescopic posts and thus fundamentally changed the design. 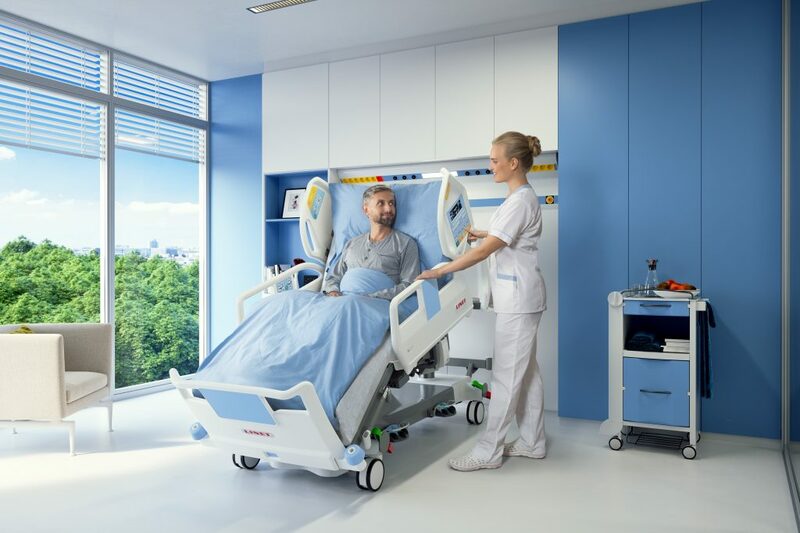 The basic model was supplemented with the most advanced electronics and servomotors, creating a bed that cares for the comfort of the patient. The beds for intensive care units are the flagship of the company’s offer. Their automatically controlled positioning system reduces the risk of bedsores. The bed can be tilted, which eases bandage and hygiene work for the medical staff. The headboard can be set to a position that provides relief when breathing problems occur and is very comfortable when eating, reading or watching TV. More comfortable seating reduces the risk of lung inflammation, which occurs when lying down for prolonged times. Height adjustment, side tilt and pull out side supports assist the patient with getting out of bed safely. Timely and appropriate mobilization can reduce the length of stay in a hospital to the minimum time necessary. Fall prevention is another important function as the bed can monitor the patient’s movements and his presence on the bed. Two monitoring modes are available depending on the level of risk. The Bed monitor system continuously monitors the main safety features of all the beds in the ward. The medical staff has information available on a computer, tablet or mobile phone. The special design allows the patient to be X-rayed directly on the bed, so they do not need to be transported to the RTG department. The overall comfort is enhanced by integrated automatic scales, which display the patient’s current weight and inform of any changes. The founder of the company, Zbyněk Frolík, graduated in cybernetics from ČVUT in Prague. He worked in the Czech Academy of Sciences from 1978 to 1988, then became the boss of the technical department of one of the largest Czech hospitals. It was there where he became interested in hospital bed technology. In 1990, after the collapse of the communist regime, he founded Linet and started from scratch the production of hospital beds and other accessories. Thanks to a number of innovations, the company has become a technological leader. Today the company ranks among the four largest manufacturers of hospital beds, which it sells to more than 100 countries around the world. Currently, Linet operates 15 subsidiary companies, e.g. in France, Sweden and the USA. Since 2011, the company has been part of the multinational holding company, LINET Group SE based in The Netherlands. Zbyněk Frolík operates on one rule: “We do not fight the competition with prices, we do it with technology. Every product or service we produce contains some unique characteristics, which you cannot find with the competitors.” The list of celebrities who have slept in LINET beds includes, for example, former Czech president Václav Havel, actor Tom Cruise and Italian politician Berlusconi.